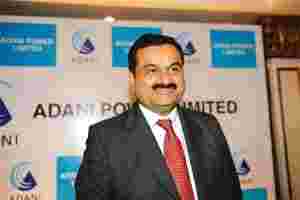 Mumbai: Indian billionaire Gautam Adani’s power company raised Rs3,020 crore in the nation’s biggest initial public offering in 18 months. NHPC Ltd, India’s biggest producer of power from water, and Indiabulls Power Ltd. plan to sell shares, taking advantage of a 65% surge in the benchmark Sensitive Index this year, to raise funds to build plants in the world’s second-fastest- growing major economy. Adani Power said it got bids for almost 22 times the shares offered. This gives a bit of a room for investors to make money as the shares are worth about Rs123 apiece, Rajaneesh Madanagopal, an analyst at Centrum Broking Pvt. in Mumbai, said by telephone on Monday. The company can fast-track all the projects which are under construction. Adani plans to use the funds to partly finance power projects in the western state of Gujarat and neighboring Maharashtra, according to its share sale document.